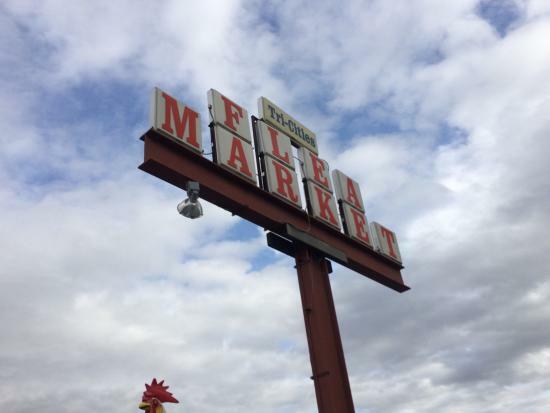 In June 1985, Tri-Cities Flea Market was founded by the late Clarence Baker Sr. and W.C. Baker Jr. They started with 4 buildings and 200 Vendor Spaces. W.C. Baker took possession when his father passed away in 1996. The next phase was the addition of 4 Open Air Sheds and 2 enclosed buildings by W.C. Baker Jr. in 1999. Chad Baker, the son of W.C. Baker Jr., started the phase in 2002. Chad Baker has added over 272 Outdoor spaces. In 2006, Chad constructed building 12 accommodating 180 spaces with 7 areas for Food Court and Snack areas. Tri-Cities Flea Market is situated on 30 acres. The Flea Market currently has 8 indoor Buildings, 5 Open Air Sheds and 272 Outdoor Spaces, which all are totally handicapp accessible.